From blockbuster musicals to classic plays, this year’s Broadway shows have cast at least half a dozen black actors in roles traditionally cast as white. Jelani Alladin was dressed in a baggy T-shirt, stylish pants, fitted hat and Nike Air Force 1s when he walked into the audition room for “Frozen” on Broadway. He had just come from a commercial audition for the activewear retail store Finish Line and said he remembers questioning if this new role was meant for him. But after his audition, the casting director gushed and asked: “Who are you? Why have I not met you?” A few callbacks later, he was cast in the principal role of Kristoff, played by Jonathan Groff in the movie, and would later make his Broadway debut. These casting choices suggest a shift among directors and producers in their openness to reinterpreting characters through a more racially diverse lens and expanding roles beyond how they may have been written or traditionally portrayed. Nearly every actor and director interviewed for this article preferred to use “color-conscious casting,” rather than "colorblind," as a way to describe this approach. “Hamilton," the 2015 musical that cast African-American and Latino actors as America’s Founding Fathers, has spawned numerous productions around the country and abroad, creating dozens of jobs for actors of color. For an industry that has struggled with diverse representation on its stage, the success of "Hamilton," with its innovative casting, and this season's Broadway lineup is a sign that improvement is possible. A diversity study released by Actors’ Equity (the national union representing professional theater actors and stage managers) examining Broadway and touring productions that opened from 2013 to 2015 highlights great disparity in the number of black actors hired in principal roles. Out of 459 contracts for leading roles in plays, just under 11 percent went to African-American actors. Out of 695 contracts for leading roles in musicals, that number drops to 9 percent. Lauren Ridloff could not even imagine herself in the role of Sarah in the revival of “Children of a Lesser God” — a performance that has earned her a Tony Award nomination for best leading actress in a play. The role was originally played by Phyllis Frelich when it debuted on Broadway in 1980 and by Marlee Matlin in the 1986 movie — both white actresses. “I just did not think that I fit the idea of Sarah, being a multiracial mother of two children,” Ridloff said. Leon, who is black, was inspired to cast Ridloff from his time spent being tutored by her. Leon’s creative decision led to critical raves for Ridloff (who had only a few acting credits when she was cast) and invited new depth to the play’s themes through a fresh interpretation of the character. “I used my own upbringing as a multiracial child of parents who separated when I was young,” Ridloff said. Sarah's father left the family when she was 5. "In my mind, Sarah's father was white and out of the picture for years, leaving a hole for her that needs to be filled. Hence, her inexplicable attraction to James." In addition to the struggles of the deaf community in society, “Lesser God” now took on racial undertones. 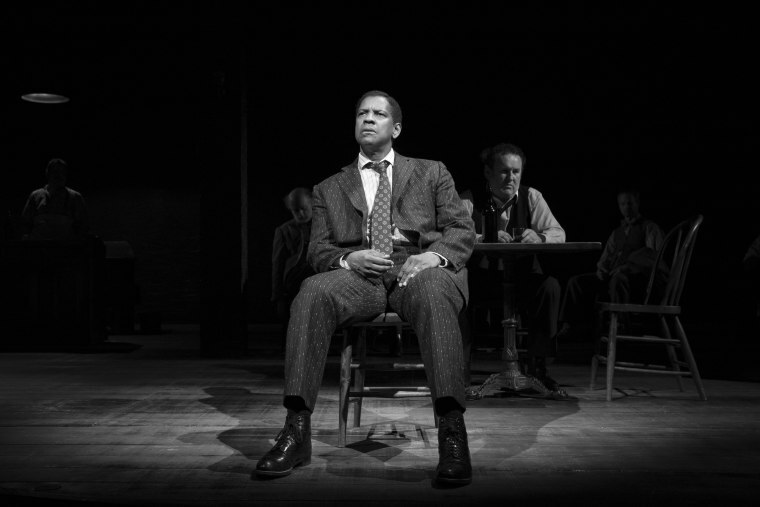 The Tony-award and Oscar winner Denzel Washington made his return to Broadway this season in Eugene O'Neill’s “The Iceman Cometh” as Hickey, the play's protagonist. The role has been played by an African-American before — James Earl Jones on Broadway in 1973 — but recent major productions have featured white actors like Kevin Spacey and Nathan Lane. While Ridloff and Leon were vocal about diverse casting adding new dimensions to “Lesser God,” the key players behind “Iceman's” revival emphasized that the impact of casting depends on the play. “I'm a human being, so hopefully I have human experiences that I bring to any role,” Washington said of playing Hickey. The play's director, George C. Wolfe, echoed Washington’s perspective. To Alladin of "Frozen," that representation is everything. While developing the show, Alladin was careful to ensure that Kristoff would be a character audiences would root for. During rehearsals, a scene was altered at Alladin’s request that had Kristoff stealing items that he and Anna need on their wintery journey. Cautious not to “perpetuate a stereotype,” Alladin suggested that the characters convince the shop owner to give them the items instead. “I'm not going to be up here as a black man stealing something from this man's store, because that is wrong,” Alladin said.